I'v found that from 52% contrast the ghosting disappears, but then the monitor is way too dark. I tried these settings and lo and behold it fixed the ghosting, but it creates way too much motion blur, so it seems to me like i need to experiment with different settings to find the best profile for 240hz. Overdrive tuning for variable refresh rate is a very complicated science, and very few manufacturers has succeeded in doing a near-perfect job. NVIDIA's G-SYNC tends to currently produce the best 240Hz variable refresh rate. At the Hertz stratospheres -- even a panel has response-time inconsistencies throughout it screen plane (in the fractions of milliseconds range) that can cause some weird ghost tinting in different parts of the screen (middle vs top). 1ms is a tiny fraction of 60Hz refresh (1ms vs 16.7ms) but is a giant fraction of 240Hz (1ms vs 4ms) and that's why pixel pixel response time inconsistencies (possibly interacting with LCD inversion inconsistencies) start to become more visible at higher Hz -- and can manifest itself in weird ways like slight tints to ghosting artifacts or other. - Attempting to fix strobe crosstalk. Try calibrating using the Lagom Contrast pattern and try a dynamic-range reduce carefully -- calibrate until you see all squares, then try to slightly brighten your digital black level a bit. (And/or slightly darken your digital white level a bit). The only setting that allows this on the monitor menu is contrast, but to get rid of the ghosting it needs to be set at <=52% and at that point whites look like grey. I had this same problem on all my AW2518HF samples, doesn´t matter if it had freesync ON or OFF. Had to turn the contrast so low to eliminate it partially. Eventually got rid of this monitor and now I´m about to buy the Asus XG248Q. If you want to keep the AW you will have to deal and accept this issue, nothing to do. It happens on the other models too, maybe except the PG258Q, from my testings. I´ve heard ASUS XG248Q suffers from bad clouding issues, but I will pull the trigger on it anyway. In theory the panel is properly optimized for 240hz. Such a shame, based on the reviews i thought this would be a decent monitor. Wasn't expecting the best because it is a budget 240hz monitor, but certainly wasn't expecting ghosting as bad as this. I was contemplating returning it and getting another unit, but that would then be a waste of time if this is just how the monitor is. The one consolation is that its only really noticeable in desktop use if i pay attention to the movement closely and goes largely unnoticed in games if there is any ghosting. Just tested my monitor with an rx 480 and the usual pixel inversion artifact issues i have disappear. There is still some minor ghosting, but its considerably better on radeon. Is there anything that can be done to get it right on my nvidia gpu? I'v tried tinkering with settings in CRU and i can remove the pixel inversion artifacts by using different settings, however changing the timings too much results in more motion blur. The RX 480 outputs slightly different signal timings than NVIDIA. This does not happen on all models of monitors, but LCD inversion algorithms can vary at different signal timings, and this may be the effect you're getting. Getting worse/better. It's just simply that Radeon is using a different "default CRU settings" than NVIDIA does. Normally it should follow the monitor's EDID but sometimes a graphics card will vary (deviate) slightly from it. Also try to follow signal polarities (positive/negative signal polarity), although that should be unimportant on digital displays now, it might have an unexpected interaction effect on this particular Dell monitor. Occasionally, formulas output slightly different numbers (for whatever reasons, e.g. math rounding errors, e.g. rounding down always versus rounding to nearest 0.5) e.g. "CVT Reduced Blank" may result in different timing numbers on Radeon vs NVIDIA vs Intel for a specific mode. It doesn't always happen, but I've seen it happen. You could also switch between "CVT" and "CVT Reduced Blank", as a quick test. Try loading AMD Catalyst's custom resolution feature, screenshotting the good resolution (and then measuring refresh rate divergence in www.testufo.com/refreshrate), swapping back to your NVIDIA GPU, then typing the exact same numbers into "Manual" entry for NVIDIA Custom Resolution feature -- to duplicate the exact Radeon timings to NVIDIA. 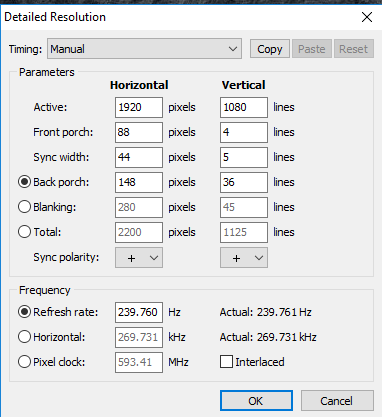 It may sometimes be difficult to determine what timings the default 240Hz is using -- to find out on NVIDIA is done via NVIDIA Control Panel -> Change Resolution -> Create Custom Resolution -> The numbers for the currently running mode now appears. (The instructions for finding the numbers for Radeon is different). If that does not work, remember that dotclock may vary slightly. Try incrementing/decrementing refresh rate by 0.001Hz or 0.01Hz. Wait about 5 minutes with CPU forced to 100%. We're just borrowing your CPU as the master microsecond-accurate clock to measure your refresh rate by, and forcing to 100% will yield the most accurate possible comparative refresh rate measurement. You can also use http://www.testufo.com/refreshrate to measure your refresh rate via the CPU's clock instead of the GPU's clock. Doing http://www.testufo.com/refreshrate on your NVIDIA and on your RADEON will sometimes show different numbers (Example: 239.987 Hz versus 240.033Hz) even if it says 240.00 in their respective CRUs. This is because the GPU clock (which GPU uses) is independent of the CPU clock (which TestUFO uses). However, this can be used to cross-calibrate an ultra-precise refresh rate between GPUs. 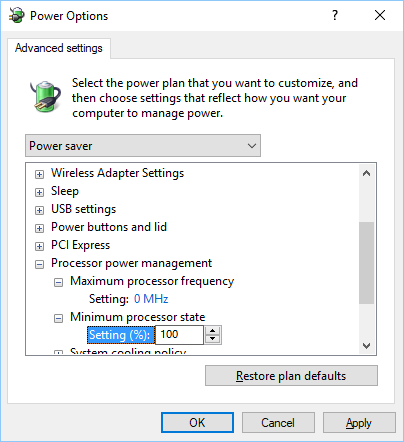 You can increment/decrement your CRU refresh rate (e.g. increase/decrease refresh rate fractionally) and then refresh the browser page (Reload) http://www.testufo.com/refreshrate to make a new measurement until the TestUFO refresh rate exactly matches what you got on your other GPU. Before you do 1 & 2, record them on your good GPU (screenshot or write down the mode, plus measure your precise refresh rate via CPU clock instead of GPU clock -- by using TestUFO Refresh Rate) then copy them to your problematic GPU. If it works, and you discover the fixed settings, post it here. I'm really starting to wonder if the monitor just throws out any values that don't conform to its normal CRU values, because anything i try results in increased motion blur, but with the benefit of no pixel artifacts/ghosting. Don't really have any insight into what effect changing the H & V sync interval settings has on a monitor. I get motion blur if i try use custom timing/CRU settings for the monitor outside the default, i mean settings where i stop noticing the ghosting. Motion blur is fine when i use the default settings. My one has minor ghosting that happens at all refresh rates, but once i go 202-240Hz it becomes worse on my nvidia card. Are there firmware updates for it? I tried looking on the site for this monitor but there is nothing.